Our students keep busy all day long with an advanced curriculum and differentiated instruction that helps them strive toward excellence. Any questions? Make sure to contact us. 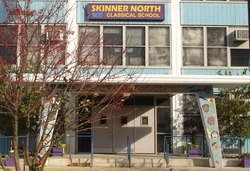 Skinner North uses the Everyday Math Curriculum, which emphasizes the application of mathematics in real world situations. Students are instructed using a workshop model approach, which consists of a warm-up, mini-lesson, centers (independent practice, work with teacher and math games), and closing. Teachers use the CPS Science Instructional Framework, which includes STC and the FOSS Curriculum, a research-based curriculum created by Lawrence Hall of Science at UC- Berkeley. The instruction is inquiry-based with students using science notebooks. Classrooms have access to a science lab setting where they will learn to work in a lab setting. Skinner North using the Common Core standards to guide literacy instruction. Teachers use a workshop model approach that consists of a warm-up, mini-lesson, centers and wrap up. This is further enhanced by the Daily 5 literacy approach, guided reading groups, and book clubs. Teachers use the Units of Study in Opinion, Information and Narrative Writing, created by Lucy Calkins. This curriculum uses workshop model and is fully aligned to the Common Core Standards. The teachers of Skinner North generate standards-based curriculum aligned to the CPS Social Studies 3.0 Framework. This Framework focuses on inquiry-based learning and higher order thinking skills along with content and literacy in the social sciences, global connections, civic connections, and economic connections. Ms. Fahey instructs students in Kindergarten, first, second and third grade. Students learn about music through lively activities including listening, writing, singing, and moving to music. Children's books, manipulatives, and singing games are incorporated into music lessons to help children learn basic music (vocal and instrumental) skills. Ms. Glynn instructs K-3 students in art weekly. Art instructs is aligned to National Art Standards and focuses on how art impacts the world around us. Ms. Walkowski teaches Spanish weekly to students in Kindergarten, first, second and third grade. The course focuses on verbal and written Spanish language development and cultural understanding of Spanish speaking nations. Skinner North has a school-wide library where students have weekly library check out time. In addition, all classroom teachers have their own classroom-based lending libraries. Skinner North has two computer labs each with 32 computers. Students are also using iPads in the classroom and are provided with memberships to RAZ-Kids and IXL. Students go to physical education daily. Skinner North has a full size gymnasium. All students will partake in a 20-25 minute daily recess time, monitored by trained staff. If the weather does not permit for outdoor recess (i.e. below freezing, raining or other hazardous conditions), then recess will take place in the classroom. Skinner North uses the Everyday Math Curriculum (grade 4), Connected Math (grades 5, 6, &7), as well as an Algebra program (grade 8), which emphasizes the application and discussion of mathematics in real world situations. The teachers instruct students using a workshop model approach. Student instruction is based on the CPS Science Instructional Framework and Next Generation Science standards and the teachers will utilize the Sepup text. In addition, science instruction will be inquiry-based in a lab setting with science notebooks. Literacy instruction is aligned to the Common Core State Standards for ELA and incorporates guided reading groups, book clubs and novel studies to further enhance student learning. Ms. Fahey instructs 4th – 8th grade students in music weekly. Students learn music concepts through singing games, dances, listening, reading, and writing activities; as well as playing instruments. Ms. Glynn instructs 4-8th grade students in art weekly. Art instruction is aligned to National Art Standards and focuses on how art impacts the world around us. Ms. Walkowski teaches Spanish weekly to 4th-8th grade students. The course focuses on verbal and written Spanish language development and cultural understanding of Spanish-speaking nations. Skinner North has a school-wide library where students have weekly library check-out time. In addition, all classroom teachers have their own classroom-based lending libraries. Skinner North has two computer labs each with 32 computers. Students are also using iPads in the classroom and are provided with memberships to IXL.